u can also try this with 1 tomato-chopped fine and 2 tbsp cashew paste and with few crushed cashewnuts. 2 1/2 cups second coconut milk. Wash the mutton pieces with little salt atleast 5 times.keep it aside. Heat refined oil in a kadai and add saffron,sugar and fried onions and saute for 3 mins. Take a pressure pan , add mutton pieces, ginger-garlic paste,saffon-fried onions, ground spices,mint-coriander paste,almond paste,curd,green chillies,salt,lemon juice and ghee. Now add 1/2 cup ginger-garlic paste washed water,1/2 cup almond paste washed water and mint-coriander paste washed water. Pressure cook upto 5 whistles or 10-12 mins and keep it aside for 10 mins. Prepare the coconut milk(1 + 2 1/2 cups).Wash and ghee-saute 2 cups basmati rice. Open the pressure cooker and add ghee-sauted basmati rice and 3 1/2 cups fresh coconut milk.Sprinkle 1 tsp salt,crushed black cumin seeds and nutmug powder.Mix well for a min. Pressure cook this upto 1 whistle and turn off the flame. 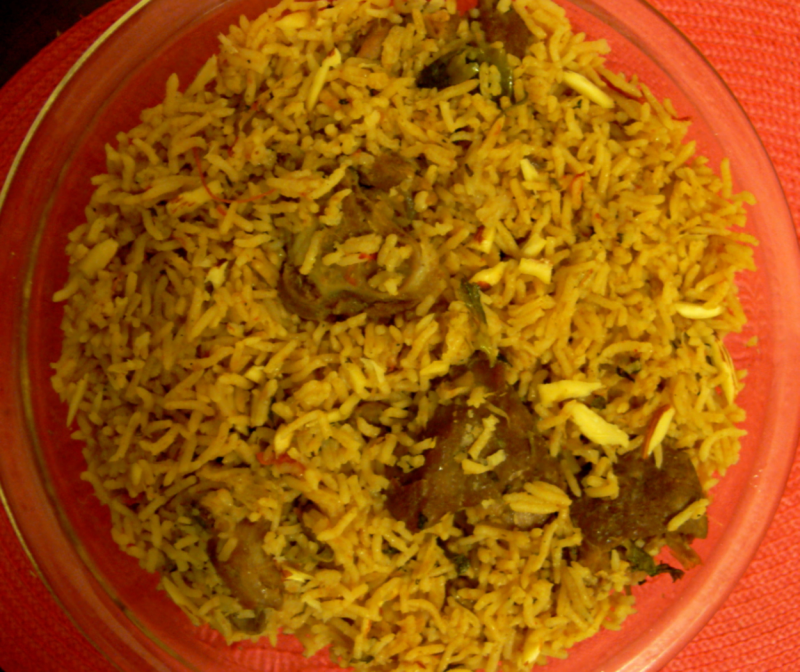 Serve this Mutton Biryani hot with raita of ur choice, or kebab. Sorry, in Step6, the thick and the second coconut milk prepared should be 1 + 1 1/2 cups respectly i.e. 2 1/2 cups in total and in Step 7: add 2 1/2 cups coconut milk along with the other mentioned ingredients.